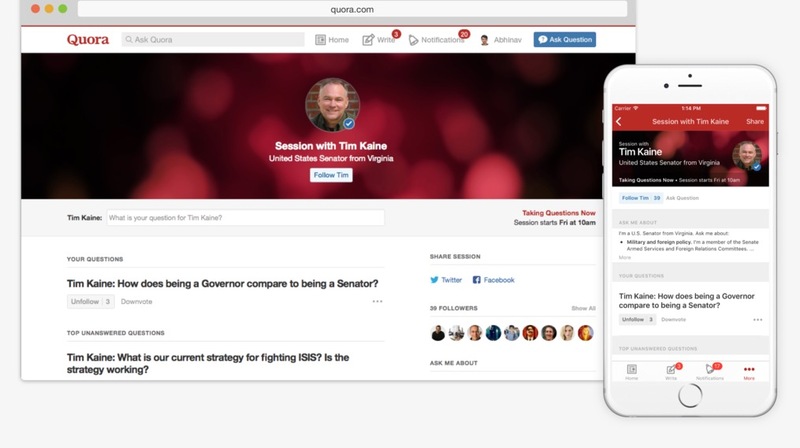 Quora has launched a new feature called Writing Sessions as an alternative to Reddit’s AMAs. Everyone knows Reddit’s AMA’s can surface the most aggressive trolls from the depths of the Web, so Quora is hoping to restore some decorum with its own version. People using the Quora app will be sent notifications when a Writing Session is confirmed, prompting them to submit their questions in advance. This gives the person answering the questions more time to develop a response and it allows Quora to remove any that are trolling or just unsuitable. Of course, it also raises the concern that the answers won’t be as truthful if they are prepared in advance. All of the accepted questions will then be posted on the app to be upvoted or downvoted and that determines the order they will be asked in when the Writing Session goes live. All of the questions and answers from the one hour Writing Sessions will remain on Quora as evergreen content afterwards as well. The first Writing Session will be with US Senator and foreign policy and military expert Tim Kaine today. You can still submit questions or vote for the ones that are already up. Some of the most popular questions for Kaine focus on US strategy for combating Islamic State and what the country’s policy is on accepting refugees. Quora says it will continue to focus on people “who have unique insights on topics that are important to humanity” for future Writing Sessions. The line-up for December includes Sheryl Sandberg, Chief Operating Officer of Facebook and Founder of Lean In; Vinod Khosla, Silicon Valley venture investor and founder of Khosla Ventures; and Cecile Richards, President of Planned Parenthood.